What will this ebook do for me? This 58-page guide will teach you the 7-step landing page optimization process, from building your first page, to user research, to forming a hypothesis for A/B testing. You'll see examples of good and bad landing pages, with tips on how you can improve your own campaigns. 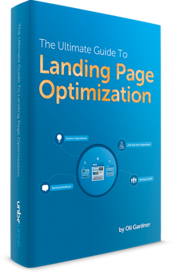 Plus, find out how to convince your boss or client on the value of landing page optimization. Everything you need to know to use landing pages for higher conversion rates on your marketing campaigns.